A postage stamp issued in 1947. Claude Pepper (1900-1989), then U.S. Senator from Florida, wrote Postmaster General Hannegan on July 9, 1947, to petition for a postage stamp to commemorate the dedication of the Everglades National Park. 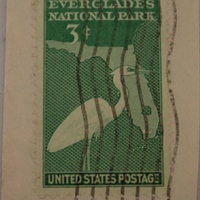 The Everglades National Park Commission had began efforts to produce such a stamp. John Pennekamp had found a former U.S. Bureau of Engraving and Printing (BEP) artist to translate ideas into a finished design to be rendered in "a pretty green" ink. BEP issued a design on October 20 and by December of that year, the resulting stamp featured an outline map of Florida and white heron. Original 1.44 x 0.84 inch postage stamp, December 5, 1947: Orlando Remembered Exhibit, Downtown Orlando Post Office, Downtown Orlando, Florida. Digital reproduction of original 1.44 x 0.84 inch postage stamp, December 5, 1947. Originally published by the U.S. Bureau of Engraving and Printing. 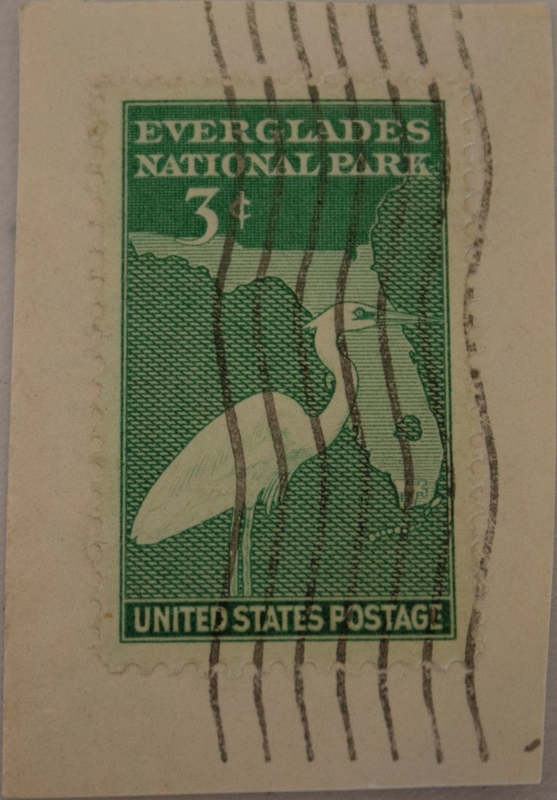 “Everglades National Park Postage Stamp.” RICHES of Central Florida accessed April 22, 2019, https://richesmi.cah.ucf.edu/omeka/items/show/5580.